One of the many reasons why we are blessed here in Pelicanland is the indisputable fact that our local Weather Priestess is a huge rugby fan. How can I tell? Well, it’s obvious, isn’t it? Year round we have nearly constant, perfect rugby weather. Of course, in any season a little rain must fall but our Weather Priestess generally schedules these brief interruptions for the weekdays, not the weekends. Take last week, for example. Most of the region had heavy rain during the week, which may have affected practices but had no effect on matches because come Saturday the weather was clear, sunny and warm, e.g. : Perfect Rugby Weather. Having such a wise, hardworking and compassionate Weather Priestess is a luxury that is not granted to all regions of this world of ours. Most of America, for example, can’t even play at this time of year – the natural season to play rugby, of course – because their Weather Priestesses are busy dumping snow all over the place. One wonders what the people who live there did to piss off their Priestesses. Did they forget to make the proper sacrifices? Just to be sure on Friday I plan to sacrifice a nice steak and a bottle of California grown Cabernet Sauvignon (2006 was a bloody good year!). Now, the opposite has occurred down south amongst our brethren of the Griffin. When looking at their Weather Priestess as it is quite obvious she is rather indolent and lethargic and as a result they don’t attend to the sacrificial duties very attentively. Don’t believe me? In San Diego the Weather Priestess doesn’t even bother creating new and exciting weather every day but just reuses the same 75 degree and sunny template over and over and over again. This lack of attention was no more obvious than at the inaugural Silicon Valley 7s when the San Diego based Tournament Director failed to make the proper sacrifices and as a result, the first cold and rainy day in 6 months showed up on that Saturday. Hopefully the lesson was learned. It is official, there can be no more doubt or controversy. South Africa is the USA’s Bogey Team. Last year we could and did beat anyone… until the Cup Semis when we would inevitably run into South Africa and lose. This year I was thinking “new season, new attitude, new results!” but was sadly disabused of that train of thought last weekend in Sydney. The USA had started the World Sevens Series horribly, finishing last in Dubai, but got a bit better in South Africa. Things looked to be back on track last weekend in Sydney when we lost a close match to home side Australia – no shame there – but steamrolled Scotland and Canada to advance to the Cup round. Our first opponent in the knockout rounds? Only perennial champions and Lords of Sevens, Fiji. Faced with such a daunting task Our Lads brushed aside the islanders 24-7 in a commanding performance. If you, dear reader, have been paying any attention at all to the last paragraph you would know what comes next. Riding high into our Cup semifinal we naturally faced South Africa and promptly got spanked 35-7. Now yes, South Africa is the defending Series champion and if we are to consistently make the Cup semis there are only a handful of teams one would expect to face. There will be the odd team like Canada in Singapore last year, or Kenya before that, or Argentina in this tournament who will make a run but for the most part it is South Africa, England, Fiji and New Zealand who will be your opponents at this late stage. Ever since our coming out party at the London 7s in 2015 we have been regular Cup round contenders and have sported a healthy winning percentage against all the other teams listed, but for some reason we can’t seem to beat South Africa. This is not to say we beat the Kiwis or the English all the time, but at least some of the time we do and on the other side, South Africa loses to these other teams as well – just not us. This is a hurdle we need to get over and soon. Part of the problem is depth. Our top 8 or 9 players can beat anyone, but once we go beyond that the dropoff is noticeable. Injuries and suspensions can happen at any time and the core of our team (Niua, Hughes, Baker and Barrett) are all getting to be elder statesmen for international sevens. We need to start developing more youngsters fast or this run will soon be looked at as a Golden Age, never to be seen again. We need to blood more young players and Mike Friday surely realizes that, so for the New Zealand leg of the Series he has called up to the squad Nick Boyer, son of the Society’s own Rich Boyer. Congratulations to both father and son on this accomplishment and to Coach Friday for noticing that international rugby talent is grown right here in Pelicanland. He will be joining local products Danny Barrett, Folau Niua, and Matai Leuta. 4 out of 12 isn’t bad. The Women’s Sevens Series was also playing in Sydney last weekend and Australia put on a performance for the ages, going undefeated to win the tournament while not allowing a single point. They won their games by scores of 29-0, 50-0, 43-0, 29-0, 31-0 and 31-0. That is complete dominance, my friends. Our women did not fare as well losing a tight contest to England 24-28 before rolling Japan, but then getting rolled in turn by New Zealand. Things went south from there on Day 2 as we lost to Russia and Spain and continued on Day 3 as we lost to Ireland in our final match. This was a disturbing result because our women have traditionally outperformed our men. While I realize that in sevens one tournament does not define a team – see US Men, Dubai – but we have historically produced some of the best women’s rugby athletes on the planet and some of these losses were galling. We looked like a team that lacked structure and cohesion and relied on individual skill to win and at the top level this does not work. At the NDS just passed the lack of support for the women’s game all the way up to the international level was passionately spoken about and if we don’t start taking our women seriously then more results like this weekend in Sydney will be the norm, rather than the exception. I am now putting the onus on USA Rugby to address the lack of support for the long term, but in the short term I am looking at the coaching staff. The women don’t play as many tournaments as the men so there are fewer opportunities to score Series points. The next tournament in not until April so there is plenty of time to work on what went wrong. I expect no less from our ladies than to be in the Cup semis at every tournament. Kowtowing is the traditional Chinese custom where a person would kneel and touch the ground with their forehead to show submission and respect. This obsequious demand was adopted by the Las Vegas Invitational years ago by their autocratic and imperious former leader to help solidify his position and it is no surprise the current administration continues this practice but they occasionally need to show respect to others in order to acquire the resources they need. The tiled hallways of Pelilcanland are covered with crazed patterns of broken tiles from the years of headbanging from the LVI organizers This year is no exception – I just wonder who is planning to pay to replace all the damaged tiles? The most competitive match I refereed this season, and the most enjoyable. Davis took the lead early and dominated with two tries and two conversions. Excellent teamwork by Davis in the first twenty minutes, it felt like it was going to be another of those high scoring one-sided matches. But Stanford was not for giving up! They came back in the second twenty hammering at Davis defense, camped down in their opposition’s half and eventually breaking thru and scoring two tries and two conversions. The match was fourteen all at halftime. Spectators, very excited. Fired up, Stanford came out stronger in the second half denying Davis any further points. Stanford scored three tries and one conversion. Despite no points, Davis plugged away at Stanford attacking from deep and coming close to scoring, but Stanford’s defense was too strong. It was an exciting second half with both sides working hard in defense and attack phase after phase, with few mistakes, penalties or stoppages. Stanford had the upper hand in the attack though, they broke through scoring points out wide, and turning over several balls at breakdowns as well as scrums. There were three yellow cards during the match, for dangerous tackles, all committed by Davis. None egregious, two committed by the same player, resulting in Davis player sent-off in the second half. Thank you, James Hinkin for referee coaching again, valuable tips and points of advice as always. I look forward to reviewing the video. A couple of venue changes landed the match at the KOT. I had an enjoyable morning coaching referees, it has been too long since I’ve participated in the KOT and it was a pleasure to return. ARC was clearly the more dominant team (6 tries per half) with several large players with nimble feet and a scrum half that was very adept at misdirection. Despite three yellow cards, the teams played in good spirits. With 11 minutes remaining, UNR’s captain inquired as to how much time was remaining. Upon being asked if he wanted all 11, he stated unequivocally and affirmatively in the positive. Gladiators can also be gluttons; kudos to his teams tenacity. NB: When the whistle is inadvertently blown because a player has seemingly scored a try (over the five meter line…), the restart should be a scrum to the attacking team. A fine platform from which one may successfully dot down the ball over the goal line. It was a beautiful day at Witter Rugby Field. This B-side match played out much like the previous A-side game, with Cal dominating the scoreboard. 20 minutes into the first half the score stood at 12-5 and it looked like this one might be more competitive than the game before. But Cal scored 77 unanswered points over the next hour to salt this one away. Even as they fell further behind, the visiting team played hard and clean to the end. On a perfect-weather-for-rugby Saturday at Cal Maritime, the Keelhaulers outscored their visitors by at least 12 tries to 1 to win 76-7. I stopped counting because I was lucky enough to have Mike Gadoua in the booth keeping the score and keeping the crowd advised of what was happening right in front of them. Thanks for the color commentary, Mike – I know the parents in the stands were happy to have that. Even some of the players were listening to your concise and accurate law descriptions. Cal Maritime had a full roster of 23, plus another dozen players watching, while UOP brought 19 and played 18. The first few minutes of the game saw 4 tries scored, 3 to Cal Maritime, with UOP taking advantage of a knock-on to run the ball in for their sole try of the afternoon. The halftime score was 19-7 (or perhaps 24-7), so it wasn’t totally out of reach for UOP until Cal Maritime began piling on the tries in the second half. The magnitude of their victory flatters Maritime a bit. UOP probably deserved more points than they got, and a silly mistake at the end of the game led to yet another try for a home team player who pounced on a ball being bobbled in-goal to score. Having said that, Maritime’s defense did well to keep UOP from scoring while they were defending with 14 players due to a carelessly high tackle which earned the offending player a yellow card in the 69th minute. Thanks again to Mike for announcing, and to both touch judges, and to Cal Maritime for hosting a great day of rugby. A lovely winter’s day in Livermore saw two young at-large teams going at it. Pleasanton Jesters U23 were hosting the Santa Barbara Rugby Academy on a partially marked, turf football field. I mean, the field was obviously used for football as it had all the 1 yard hash marks but not all of the 5 yard markers. It had soccer lines on it as well so we essentially used the soccer lines with some cones to mark where the rugby lines should be. Both teams are young and eager so I anticipated a fast match and I wasn’t disappointed. The match started out even with Santa Barbara showing more structure but Pleasanton making more line breaks. The game was back and forth for the first 20 minutes until some ill-discipline on the Pleasanton side led to quick tap opportunities and a pair of tries for the visitors. (Side note: both teams were eager to tap and go at penalties keeping both the defense and myself on our toes – they were fearless and ran it from most anywhere.) Towards the end of the first half the Jesters started putting more pressure on the Acadamians resulting in some ill-discipline on their end. 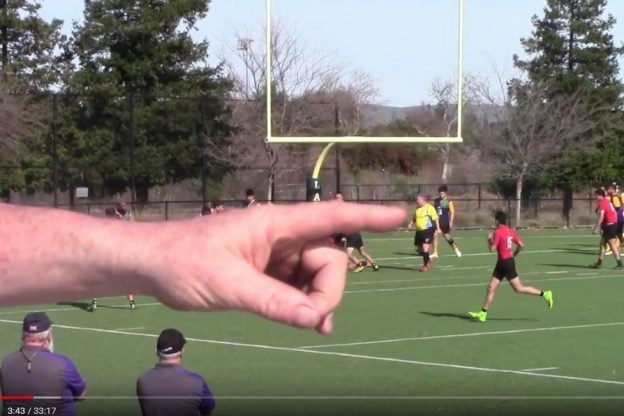 Pleasanton quick tapped and scored with a nice little chip into space that wasn’t handled well and fell kindly to the onrushing support players for a try in the middle. From the resulting kickoff came a try out of the top drawer that needs to be sent in to ESPN for their Top 10 highlights. Santa Barbara kicked deep right and Pleasanton immediately started moving the ball left across the field. Two long passes put the ball into the Jester’s big, impressive center who showed some footwork to slice through a gap into open field. Just past midfield the defense caught up with him so he threw a one handed offload to his teammate running at pace in support. Santa Barbara wasn’t beaten yet as more defenders arrived, chasing down each runner, yet every Pleasanton runner who was caught passed the ball to yet another player at speed in support, back and forth 6 times until the last man dove into the try zone for one of the best tries I have ever seen at any level. It only took a few seconds to go the length of the pitch on the kickoff earned from a try – great stuff. The half ended with Santa Barbara up 19-12. The second half was a different story, however. Santa Barbara scored early and Pleasanton replied almost immediately, but after that the fitness of the visitors began to take a toll as they pulled away. Apparently training 5-6 days a week (often with double sessions) pays dividends. Hard, probing runs up the middle led to overlaps on the outside that the Acadamians were happy to exploit. The game ended with a solid piece of play on the left side by the Jesters that created room on the right side. The ball worked its way to their fullback who beat the last man to casually stroll to the try zone and put the ball down… about 2 meter short. The ensuing scramble saw a Jester player knock it on and the game ended. A good game from two good sides. In their first fixture of the year saw Life West playing some of their top side to get the rust off before PRP begins. This dominance ran throughout the game and showcased their backs. The scrum was in the hands of Santa Rosa for the majority of the match. They will have a strong scrum for teams to contend with in the remainder of the season. Following the CSUMB Sea Otter Women’s visit, this Pac West Conference league opener got off to an auspicious start with a formation fly past of five law enforcement and rescue helicopters. This however was scant consolation for the fate of the technical zones requested of the groundskeepers the day before while I was at Sac State for the KOT referee development program. Spotting them painting the pitch for the next day’s festivities, I realized that this was my chance – for once – to have properly marked technical zones. Summoning my celtic charm, I persuaded the crew to paint technical zone boxes stretching from the 10m lines to the 22m lines. The next day, I found beautiful technical zones painted in exactly the right places with exactly the right dimensions. There was only one problem. They were now under the portable bleachers which had been brought in that morning to seat the fans, and which could not be moved. Back we went to the half-assed oddly-shaped technical zones with which you are all so familiar on the other side of the pitch marked by cones. The balance of nature in Pelicanland had been restored. The UNR Wolfpack shot out the gate, scoring twice in the first ten minutes to get out to a twelve point lead. The Hornets were far from done, though, and matched UNR’s smash mouth rugby in tight and their pace and handling out wide as they warmed to the task, pulling them back to 10-12 in the 26th minute. The two scrum halves were having a tremendous contest at every scrum and every breakdown. As Sacramento piled on the pressure, UNR repeatedly infringed, and a not back any penalty on top of the off feet and not rolling away penalties that preceded it saw a temporary cessation of scrum half hostilities as the UNR #9 spent ten minutes on the sideline to cool his ardor and reflect upon his team’s errant ways. The Hornets capitalized with another try, taking their first lead of the match into the break at 15-12. It was all Hornets again as we got back underway for the second half, with a try coming in the 41st minute to take the score to 20-12. Back to full strength, the Wolfpack came roaring back with a try of their own to close the gap to three points. Alas, mid-way through the half, the Wolfpack fullback had a rush of blood to the head. Beaten, he lashed out with his foot to trip his opponent. UNR were back down to 14 players, this time permanently, and they were still behind. The next score was crucial, and it was the visitors who got it, getting their noses back in front 20-24 with fifteen minutes to play. It turned out that at this point that the earlier fly past had been a harbinger, and we required both law enforcement and rescue to help a Hornet with a serious leg injury apparently resulting from a freak accident jumping over a prone player on the ground and landing badly. The Sacramento State trainer did a wonderful job caring for him, and had already called 911 in the moments it took for me to reach the injured player. Police and fire were quickly on the scene. After a 20 minute hiatus while the player was cared for by the first responders, he was transported to hospital for further treatment. As the match restarted, there was still everything to play for in the remaining 15 minutes, and the next score would once again be telling. The 14-player Wolfpack ran in two in quick succession, taking the score to 20-38. The Hornets fought until the last, scoring in the 78th minute to peg back the UNR lead, but ran out of time, and the match finished 27-38, giving the Wolfpack a win on the road to open their season. This was an exciting game of rugby with great physicality and solid handling from both sides. This bodes well for Pac West play this season. Best wishes for a speedy recovery for the injured Hornet, and thanks the Sacramento State staff for all their support on the day. Sac State Women hosted the Monterey Bay Otters this past Saturday at Sac State. Enjoyable game played in good spirits. Sac State scored first and seemed to be in control until their center went down with an injury. After that Monterey utilized their pick and drive to draw defenders into the ruck zone and then used their outside center to dramatic effect, scoring 3 of the 4 tries, a penalty kick, and a conversion. Apparently UCSC had been told by SFSU that there would not be a B side and since the UCSC vans were otherwise committed, they left their B squad at home. SFSU indicated that they would field some sort of B side (despite being very short of players) but if UCSC didn’t have the players … Either way no one had notified the referees. He said he said with the result of no B side so I had a nice sunny afternoon on TI watching Matt Hetterman referee the A side game. The final score is indicative of the cohesive play by Stanford…good coaching and seasoned players. San Jose St had several players seeing rugby for the first time many of whom are tremendous athletes. The consensus on the day is teams that meet SJSU early in the season are much better off than those that we will see this team after they have had a chance to learn the game. SJSU’s learning curve will determine their success this year, they have the players to compete. Beautiful, sunny day at Steuber field. Humboldt made the long drive to Palo Alto Friday night and must have had a good night’s sleep and their Wheaties for breakfast because they came out firing in the first 30 minutes. Humboldt had a great game plan centered around possession controlled by their powerful forwards and spinning the ball out to their backs after the defense got sucked in. Both Humboldt props and their #8 captain consistently broke the gain line and their #10 and #13 combined for some well-worked backline moves to score several early tries. Humboldt were up 26 – 7 before Stanford knew what hit them. However, Stanford was up to the challenge and once their brilliant #10 realized they couldn’t run through or around the Humboldt defense, she decided to turn the defense around with some well-placed kicks that led to 2 consecutive tries within 10 minutes to close the 1st half. HT 26 – 21. Stanford came out firing in the second half with a try within the first 5 minutes and it had the feeling of a second half runaway. Humboldt continued to soldier on and scored another try but the depth of the Stanford bench and their superior fitness eventually won out. FT 41 – 48. Overall a wonderful, fun game played with great spirit by both sides. Thank you to John Pohlman for the input and feedback. Another beautiful day for rugby in Santa Cruz. I arrived at the parking lot at the Lower Field about forty minutes before kickoff, and it was 59F with plenty of sun. Had the game been a day earlier, it would have been a good ten degrees colder, somewhat windier, with cloud over the Santa Cruz Mountains. UC Santa Cruz does have some elevation, after all, and I have refereed a game there a dozen years back when it actually started to snow at the end of a match against Santa Clara during the last minutes of play. I heard one student on the sidelines before the match complain about the cold weather and rain that visited the Monterey Bay area during the week. Face it, in this current decade there have been way too many high pressure zones during winter that have made winter feel less like it used to in decades past. Both teams were warming up, and the field was in order, though I had flags at the tens removed (why are flags put there? Suggestion: look at a pitch online!) and had in goal flags put on the touch lines. The tech zones were roped off near the touch line on the ocean side of the pitch, unlike a few weeks back when Santa Cruz’s second side hosted Cal Poly’s freshman team, so there was no mistaking the tech zone line nearest touch as the touch line! Fresno State had arrived by bus, and think of how no one had to drive the distance from there to Santa Cruz. Fresno State won the toss and elected to defend the east end of the pitch. In the first few minutes of play UC Santa Cruz seemed to have the upper hand, and pressured the Bull Dogs in their own 22, and at a ruck an infringement led to Tina Bullington easily kicking a penalty to give the Banana Slugs a quick 3-0 lead just four minutes into the match. Fresno State responded within a few minutes, getting a turnover in a counter rucking situation inside the home team’s 22, to the left of the posts, and flyhalf Jenna Balestra fed the ball out right to the backs, with full back Jacklyn Blackenship filling into the line, and scoring the first try of the match. Balestra missed the conversion. For about ten minutes both teams stymied any offensive threats, with hard tackles being made. From a scrum just inside Fresno’s own 22 in the midfield, Balestra, getting a pass from scrum half Raquel Macias, took advantage of a split backs formation to run through a gap that presented itself, and took off for a long run, motoring away from Santa Cruz’s backs who were desperate to catch her. Eventually she was brought down just inside the home team’s quarter, but dished off a pass to the other member of the half back combination, and Macias scored under the posts. This time the conversion was good and now Fresno State had a 12-3 lead. Nearer to the end of the half Balestra would score from a tap penalty. Her attempt to convert failed, and at the intermission Fresno State had a comfortable 17-3 lead. Six minutes of injury time was played because of one injury to a Fresno player who badly pulled a groin muscle, as she said she heard a pop when she went down in a tackle, therefore requiring some time to get her off the pitch as her left leg was virtually in a crippled state. One other note was that there was some chatter from UC’s coach on the sideline, complaining about a few calls. I’ll only say that when a ball is loose on the ground, a player can go to ground and attempt to secure it, and then can play the ball off the ground, pass it off the ground, if done very quickly. That player need not get back on his or her feet to do so. Check the law book! At half time I let the assistant coach know that that was how I had seen a few of these situations on the pitch, so I did not penalize for playing the ball off the ground. I also try to play advantage as much as I can. I won’t blow a whistle if I see that the non-offending team might play on and gain ground. I had my arm stuck out and even yelled out “advantage” at those moments during this match, so it’s a bit bothersome to hear any coach yelling out that a penalty has been committed when I’m playing advantage for his or her team. I can’t report any verbal abuse, then, but can report that the coach of UC Santa Cruz needs to keep it down on the touchline. If UC Santa Cruz had any hopes of a second half comeback, they were dashed quickly. Fresno State’s dominant possession of ball meant that the Slugs were making many tackles. A few players on each side went off injured, but as the second half wore on, Santa Cruz could not take down runners as they had in the first half of the match, as they were getting worn out. At 43 minutes loose head prop Vanessa Maravilla crashed over the goal line for another Bull Dog try. About ten minutes later another counter ruck by the visiting team, well inside their own half, led to a Macias try. Balestra was in support and indeed had made the initial break out when the ball was turned over, and they seemingly toyed with Santa Cruz’s full back, Bullington, in passing the ball to each other a few times each inside the Slug 22, as though in a two on one drill in training. A dozen minutes more had gone by when flanker Megan Oleski of Fresno State scored from a five meter set piece, as Santa Cruz had held up a Fresno player’s attempt to dot the ball down in the previous phase of play. Eight minutes from no side Balsestra would once again score a try. The game ended with one more Fresno State try as Blackenship got her second of the match. The final score was 44-3 as the Slugs failed to cross over the opposition goal line. Fresno State just had too much talent for the home side to overcome. The whole team is solid from #1 to #15, and Macias has performed well as a replacement at scrum half for injured Moriah Halteman. She suffered a rib injury in the first half of the match, went off for some five minutes, and returned as she was not substituted. Regarding chatter from the sidelines, at one point mid-way in the second half, on awarding a penalty to Fresno State, I marched off another ten meters, as I was not happy with another complaint from the Santa Cruz coach. I saw that the Santa Cruz team, flyhalf Loren Roundtree in particular, didn’t use any real tactical kicking as it had the previous week against Santa Clara. The few kicks that were made went right into the hands of Fresno’s backs, as opposed to finding some space to make them turn around and retreat. At one point in the second half a desperation kick by a Santa Cruz player from inside their 22 was no where near touch, and as it was a weak kick that didn’t go high enough or very long for that matter, no Santa Cruz player was able to put some few of their own onside, players who were up field some fifteen or so meters from where the kick was taken, as a Fresno player caught the ball and ran forward into opposition to be tackled. Fresno opted for the scrum from the given penalty. One other note is that it was heartening to see Brittany Wiedner return to the Banana Slugs, as she had dropped out of school when the 2015-16 year ended, but was able to get financial support to continue her studies at UC Santa Cruz. I hate to see any rugby player dropping out of school, as college is so much more expensive now than forty-five years ago when in the middle of my studies. When the rugby gods want to let everyone to know who is in charge of the match they don’t mess about. This entry was posted in News on January 31, 2018 by James Hinkin.